Starring Louis Ashbourne Serkis, Tom Taylor, Rebecca Ferguson, Patrick Stewart, Angus Imrie, Rhianna Dorris, Dean Chaumoo, Denise Gough, Skye Sammarchi, Nathan Stewart-Jarrett, Connor Wolf, Amir Wilson, Jag Patel, Nick Mohammed, Louis Martin, Colin Matthews, Adam Leese, John Kinory, Keyaan Hameed, Eileen Davies, Genevieve O’Reilly and Zak Holland. Distributed by 20th Century Fox. 132 minutes. Rated PG. Make no mistake, this film has no story relation to the classic 1975 scoundrel adventure film The Man Who Would Be King (or the Rudyard Kipling story it was based on). Instead, The Kid Who Would Be King shares far more parallels with King Arthur and the Knights of the Round Table. It is a modern day take of the King Arthur story, where our hero, Alex (played by Louis Ashbourne Serkis – son of Andy Serkis) has been chosen to pull the sword from the stone. He is thrust into a position of King. Then he must save all of Great Britain from the return of Morgana (played by a very creepy Rebecca Ferguson) as the world sinks into global division and never-ending negative headlines. The film starts with a lot of promise in it’s animated, comic-like retelling of the King Arthur story. This section ends with Morgana entrapped in the underworld awaiting her chance to return when the world has once again lost hope and settled into its own self destruction. It’s dark. Really dark. Morgana would have given me nightmares if I was a small child. She’s scary entrapped with creepy vines being sent out from her body as underground surveillance devices. Even scarier when she transforms into a demonic flying creature. But times have indeed changed, and the audience was filled with little ones oohing and ahhing and at times shouting in surprise throughout the film. The dark tone does not end with the opening animation. Right from the start, we learn that Alex and his only friend, Bedders (played by Dean Chaumoo) are the target of relentless school bullies – Lance (played by a menacing Tom Taylor) and Kaye (played by Rhianna Dorris), who Alex later recruits as his unwilling knights. The bullying is hard to watch and goes on for quite a while, but later is used to form some positive, strong messages. If I were to choose a target audience for The Kid Who Would Be King, I would have guessed third to sixth grade. That is old enough not to be to scared, yet young enough to still be amused by even the most annoying running gags. For example, Merlin (played by Angus Imrie and Patrick Stewart as he shifts from young to old to an owl) uses exaggerated hand gestures as his avenue for magic. Maybe it’s just me, but I feel like exaggerated hand gestures as running gags should have been retired with Ross and Monica in Friends in their attempt to secretly flip the bird. Overall, I feel like the kids did a great job in their roles, pushing through fear and negative relationships to forge friendships and to fight for their world. The adults, however, were completely inconsequential. For most of the movie, they are zombie-like, or have even disappeared. As an adult watching this film, it was annoying, but I would imagine it would be empowering and make the film more fun for its young target audience. The film does a good job explaining why adults “disappear” – at nighttime, Morgana’s army comes out from the underworld and only those who have been knighted remain. Once the armies are destroyed (each night), the adults and other unknighted folk return. This leads to some funny scenes, like the reappearance of the driver of a borrowed car at the end of a chase scene, while the kids were still in the car. While creating the appearance of unnecessary adults, it does allow the story to be a bit more believable, as Alex and his knights maneuver around in the adult world unencumbered by traffic, supervision, or questions. 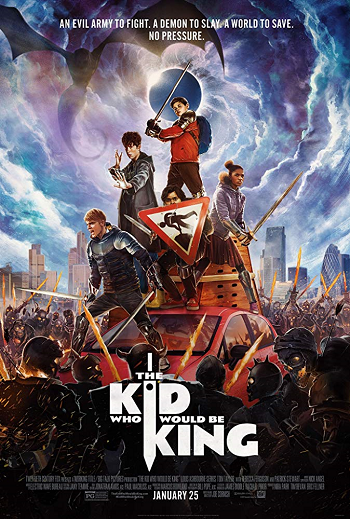 Overall, while it’s sure to not be my favorite movie of 2019, The Kid Who Would Be King is worthy of a family night out. The kids will be entertained. The parents, less so. But in the end, this is a film focused on this generation as our future. I hope they are listening to the film’s strong end message, to take action in spite of the chaos in today’s world. Copyright ©2019 PopEntertainment.com. All rights reserved. Posted: January 25, 2019. Tags: Adam Leese, Amir Wilson, Andy Serkis, Angus Imrie, Bonnie Paul, Colin Matthews, Connor Wolf, Dean Chaumoo, Denise Gough, Eileen Davies, Genevieve O'Reilly, Jag Patel, Joe Cornish, John Kinory, Keyaan Hameed, King Arthur, Louis Ashbourne Serkis, Louis Martin, movie review, Nathan Stewart-Jarrett, Nick Mohammed, Patrick Stewart, PopEntertainment.com, Rebecca Ferguson, Rhianna Dorris, Rudyard Kipling, Skye Sammarchi, sword in the stone, The Kid That Would Be King, The Knights of the Round Table, The Man That Would Be King, Tom Taylor, Zak Holland. Bookmark the permalink.